Three years ago, Minneapolis organizers stood outside their local police precinct to protest the fatal shooting of Jamal Clark, a 24-year-old black man who died at the hands of the police. Since then, efforts have been made to improve relations between Minneapolis' black community and local police — but that all went out the window last week when a photo of the precinct's Christmas tree hit social media. 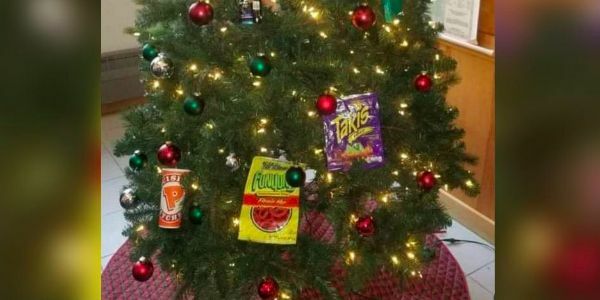 Two police officers decided it would be funny to decorate their Christmas tree with objects they felt represented the black community they are supposed to serve and protect — namely, with trash. The tree had a cup from Popeyes, empty cans of Steel Reserve malt liquor, packs of Newport cigarettes, and a strip of police caution tape to top it all off. Please sign this petition demanding that the police officers responsible for the decorations are fired immediately. By mocking the black community with offensive stereotypes, these officers have shown they are unfit to be police. You cannot protect all members of a community if you don't respect everyone in it — especially when so often this kind of disrespect leads to unnecessary police shootings of black people. The officers have been put on paid leave pending an investigation, but that's not enough. They need to lose their jobs in Minneapolis and be prevented from working as police again. Many officers who are let go for misconduct often become "gypsy cops," or cops that frequently transfer to other departments. If a police officer is fired for misbehavior, they should not be allowed to be a cop anywhere. If you agree, please sign this petition, and let's make sure these officers are fired from the Minneapolis Police Department and never allowed to work as police again.